HALLOWEEN TOWN is a free interactive haunted display that is located in Algonquin Illinois during the month of October. Halloween Town was first created in 2006 by homeowner Jim Haupert. It all started with a tiny graveyard and a few skeleton lights. Kids enjoyed the display while parents would photograph them in the graveyard on Halloween night. Every year the display grew larger adding lights, fog and GHOULS and in 2008 with the addition of JACK SKELLINGTON, HALLOWEEN TOWN was born! Since then, a WHOLE LOT has changed! HALLOWEEN TOWN now includes Jack's partner, SALLY and his dog ZERO. Ocasionally the MAYOR himself will stop by during the HALLOWEEN season. In addition, there are PNEUMATIC PROPS within the cemetery gates, an inviting graveyard walk thru brings spectators and victims of every age, up close and personal to their darkest fears! 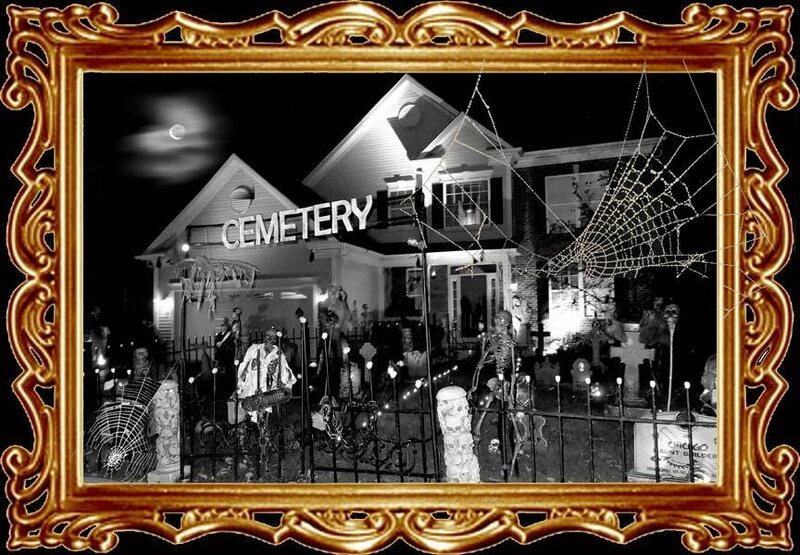 ZOMBIES, GARGOYLES, BATS, and SKELETONS, await you in this haunted cemetery! BLEEDING FOUNTAINS, CREEPY COFFFINS, and much, much, more can be seen here in HALLOWEEN TOWN.